Steel frames have been installed at several stations in Area 1, including this one at southbound Airport Rd. and 112th St., near Paine Field. Eastbound, 132nd St. and Elgin Way/Dumas Rd. Northbound, Airport Rd. and Kasch Park Rd. Southbound, Airport Rd. and 110th St.
Area 2 is scheduled to be quiet next week, with the exception of work planned at the westbound, 128th St. and 4th Ave. station site. Nighttime work (8 p.m. to 4 a.m.) grading is planned to prepare for daytime (9 a.m. to 2 p.m.) concrete pouring. The far-right lane will be closed during these times. Daytime (9 a.m. to 2 p.m.) work will include pouring concrete for the sidewalk, curb and station platform. This may require one night (8 p.m. to 4 a.m.) of grading preparation. Southbound, Bothell-Everett Hwy. and 153rd St. Nighttime (8 p.m. to 4 a.m.) work is scheduled midweek on the site's drainage and stormwater systems. Construction at this station site gets underway next week with both daytime (9 a.m. to 2 p.m.) and nighttime (8 p.m. to 4 a.m.) scheduled throughout the week. The Swift Blue Line stations are ready for a fresh coat of paint! This spring and summer all 33 Swift Blue Line stations will be repainted. It will take about a week for each station to be repainted. During that time, the station will be closed off so the work can be done quickly and in an environmentally safe manner. Repainting is expected to begin later this month and continue through the end of summer. Community Transit has resumed the installation of upgraded ticket vending machines along Swift Blue Line. Upgraded machines have been installed at all southbound stations, both terminals, and the northbound 238th St. and Gateway/216th St. stations. When installations resume next week, crews will work their way northward, upgrading machines at the remaining northbound stations. The upgrade project is expected to take a few more weeks. Video instructions for using the new machines are available at www.communitytransit.org/SwiftTickets. 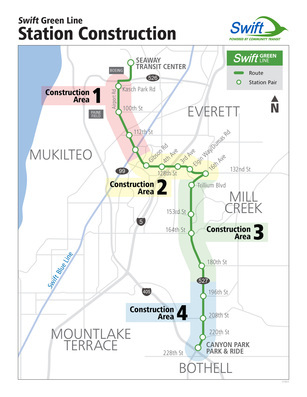 More information about Swift Blue Line is online at www.communitytransit.org/SwiftBlue. Drier weather this week allowed crews to begin pouring what will eventually total nearly 2 acres of concrete on the site of the future transit center. Large portions of the bus lanes were poured; it's easy now to imagine buses pulling in from the driveway. More concrete will be poured during the next 2-3 weeks (weather permitting) to complete the bus lanes, curbs and bus platforms. One northbound lane of Seaway Blvd. will close as needed for the next 2-3 weeks as crews construct a bus pullout on Seaway. Most lane closures will occur during daytime hours, but a few overnight closures are possible. 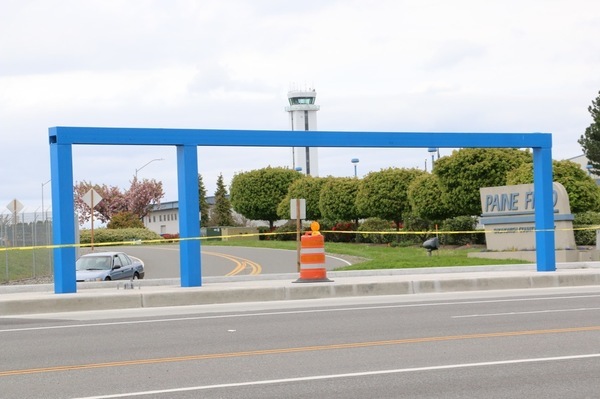 One eastbound lane of 75th St. may be closed May 5 while PUD performs work in preparation for new power to the transit center site and local businesses. Other lane closures, with flaggers, will continue as needed on 75th St. throughout the month of May. Sidewalks and Curbs and Driveways, Oh My! This week's drier weather also had concrete flowing into new sidewalks and curbs on 128th St. near the northbound I-5 on-ramp. Concrete pouring will continue next week to complete the western Quality Inn/Shell station driveway. The driveway will be closed May 7-11, as weather permits. Next week, crews will continue to do demolition and temporary signal work from 8 p.m. to 5 a.m. near the southbound I-5 on-ramp.